Camp Polk was officially completed August 1, 1941. 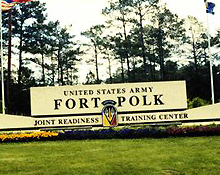 Soldiers of the World War II and Vietnam eras would scarcely recognize the new Fort Polk. Most of the old wooden buildings have been replaced with modern barracks, motor pools, unit administrative offices, and service facilities. After more than half a century of service, U.S. leaders continue to place their confidence in Fort Polk.